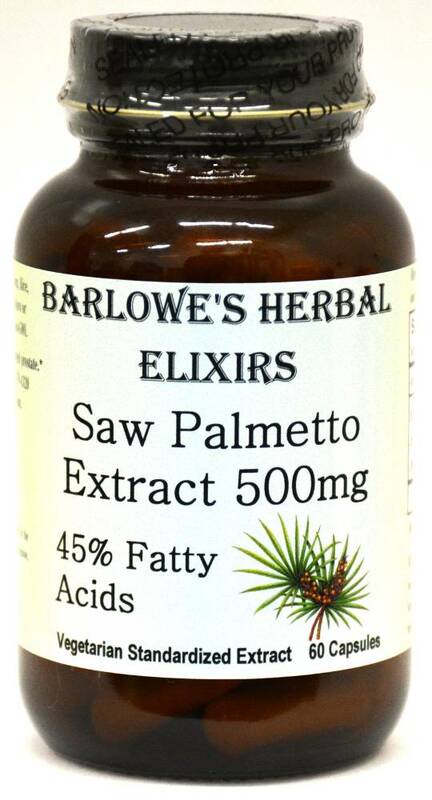 Barlowe's Herbal Elixirs now offers a Saw Palmetto Extract standardized to 45% Fatty Acids, supplying 225mg of pure fatty acids per capsule. Saw Palmetto is best known for treating the symptoms of an enlarged prostate (BPH, benign prostatic hypertrophy). It may support prostate and urinary tract health and help prevent hair loss. Bottled in Glass! No Stearates! No Fillers! No Junk! Barlowe's Herbal Elixirs now offers a Saw Palmetto Extract standardized to 45% Fatty Acids, supplying 225mg of pure fatty acids per capsule. (Most of the saw palmetto soft-gels on the market only supply 145mg of pure fatty acids, and they contain gelatin as well). Saw Palmetto is best known for its use in treating the symptoms of an enlarged prostate (BPH, benign prostatic hypertrophy). It may support both prostate and urinary tract health. Saw Palmetto may also help prevent hair loss. 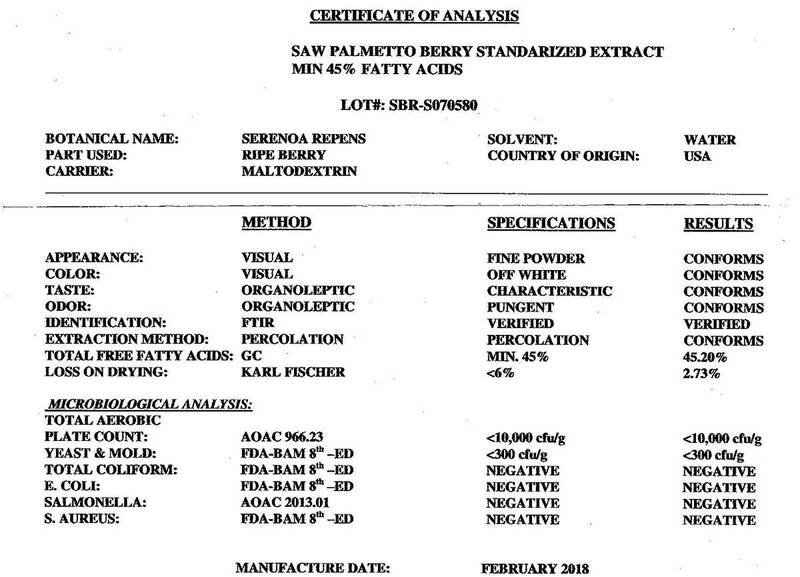 The Saw Palmetto Extract Certificate of Analysis (COA) for this particular batch is shown above. Bottled in Glass! No Stearates! No Fillers! No Junk! 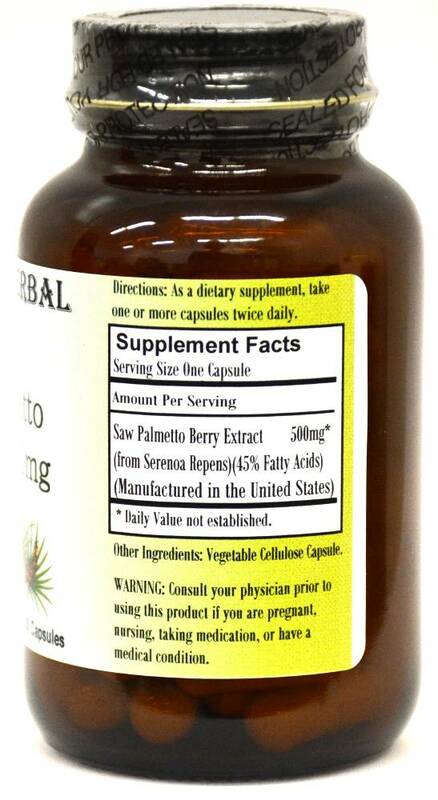 Caution: Barlowe's Saw Palmetto Extract is generally safe, but it is potent and should be utilized with care. This product is for dietary use. If side-effects occur, discontinue use immediately! The above statements have not been evaluated by the Food and Drug Administration (FDA). This product is not intended to diagnose, treat, cure, or prevent any disease. Directions For Use: Take one capsule twice a day with water. Results and usage amounts may vary based on body type and weight.